Synthetic Winch Rope For ATV/UTV | WARN Industries | Go Prepared. Having the correct rope and treating it right will not only make it last longer but it’ll ensure that you can get out of any situation without it snapping mid-pull. Treat your rope right by using a proper fairlead to decrease fraying and ensure the rope pulls smoothly. With such a variety of fairleads and ropes it’s crucial to find what works best for you and your ride. For use with all WARN ATV winches with aluminum drums. Includes synthetic rope, rock guard sleeve and roller fairlead.For PV4500, V4000, RT40 and 4.0ci winch. 50' of 7/32" diam. The 1/4" diameter rope is lightweight, easy to handle, and won't rattle in a cargo box. Easily attaches to the winch cable to provide an additional 50 feet of distance. 4,000 lb. single line capacity. Constructed of forged billet aluminum, with a hard anodized gunmetal finish. Designed with a large opening radius to help minimize rope wear. For use with synthetic rope only. Designed to be used with synthetic rope, and to decrease the possibility of fraying. Replacements available for both ProVantage and Vantage winches. Cast aluminum construction with durable black powdercoat and polished aluminum surfaces. 7.37” wide. Cast aluminum construction with durable black powdercoat and polished aluminum surfaces. 6.25” wide. Cast aluminum construction with durable black powdercoat finish. 7.37” wide. Cast aluminum construction with durable black powdercoat finish. 6.25” wide. Reduces excessive wear on your winch cable or wire rope and aids in angled pulls. Upgrade from hawse fairlead on RT/XT 15 series, 1.5ci or A2000 winches. For use with all WARN mounting kits except PN 29268 and 29257. 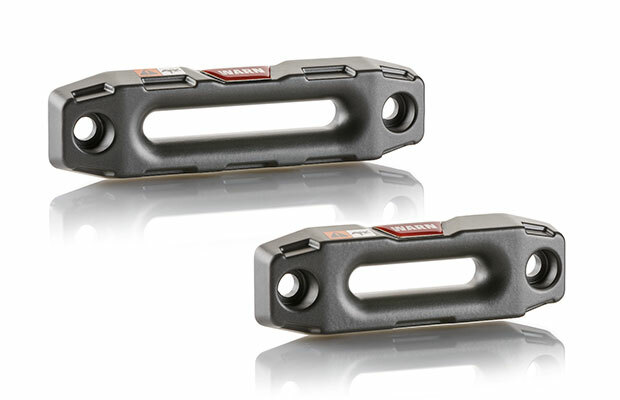 Replacement fairlead for RT40 or 4.0ci utility vehicle winch.